N. G. Henshaw and brother, H. M. Henshaw, spent Xmas at Bellevue. Messrs. N. and H. Henshaw, of New Iberia, visited Bellevue again this week. The Misses Cade and Smedes Cade, of Youngsville, and Harold Henshaw, of New Iberia, were the guests of Miss Rose DeBlanc on Thursday. Henshaw, Charles, head-of-household, age 37, born in Missouri; father born in Louisiana; mother born in Missouri; single; occupation: president, [..unclear..]; owned home (free). Henshaw, Neville, brother, age 30, born in Missouri; father born in Louisiana; mother born in Missouri; first marriage, married 6 years; occupation: author, [..unclear..]. Henshaw, Julia, sister-in-law, age 26, born in Virginia; parents born in Virginia; first marriage, married 6 years; 2 children, 2 living. Henshaw, John M., nephew, age 4 [unclear], born in Virginia; father born in Missouri; mother born in Virginia. Henshaw, Herbert P., nephew, age 2 [unclear], born in Virginia; father born in Missouri; mother born in Virginia. 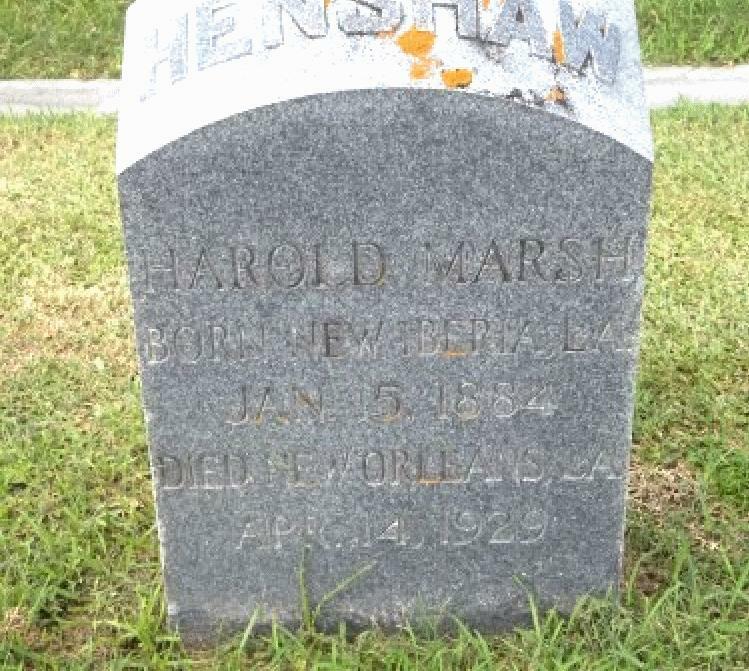 Henshaw, Harold [unclear] M., brother, age 26, born in Louisiana; father born in Louisiana; mother born in Missouri; first marriage, married 3 years [unclear]; occupation: planter, sugar [..unclear..]. 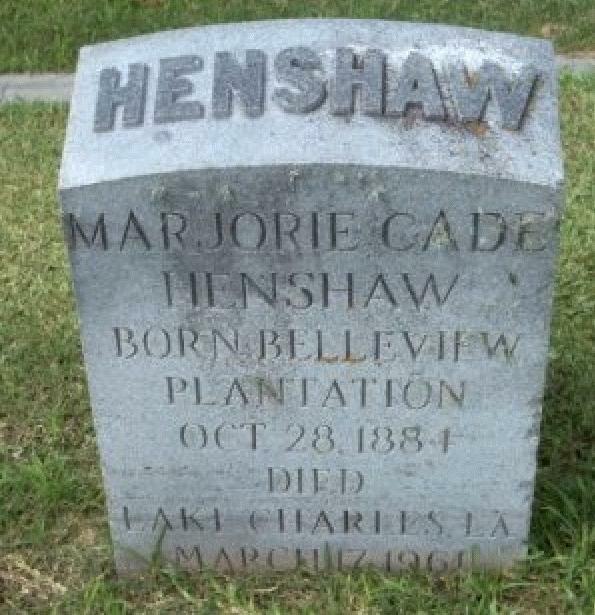 Henshaw, Marjorie, sister-in-law, age 25, born in Louisiana; father born in Louisiana; mother born in Mississippi; first marriage, married 3 years [unclear]; 1 child, 1 living. Henshaw, Harold Jr., nephew, age 1, born in Louisiana; parents born in Louisiana. Henshaw, Marjorie, head-of-household, age 46, born in Louisiana; father born in Louisiana; mother born in Mississippi; widow; owned home ($12,000 value); radio in home; occupation: none. Henshaw, Harold M., son, age 20, born in Louisiana; parents born in Louisiana; occupation: torsion b[..unclear..], oil. Henshaw, Ashbel B., son, age 16, born in Louisiana; parents born in Louisiana; attended school. Henshaw, Marjorie, head-of-household, age 55, born in Louisiana; completed 4 years of college; on Apr 1 1935 was living in the same house; widow; rented home ($50/month rent); occupation: retired home keeper; $0 wages in 1939, plus other income. Metze, Herbert A, lodger, age 30, born in Louisiana; completed 4 years of college; on Apr 1 1935 was living in rural Gregg County, Texas; occupation: engineer, petroleum; worked 50 weeks in 1939; $1850 wages in 1939. 1910 census, 3rd Ward, New Iberia, Iberia Parish, Louisiana; roll T624-514, ED 19, page 28A, line #1, dwelling #513, family #538. 1930 census, Ward 3, Lake Charles, Calcasieu Parish, Louisiana; roll T626-788, ED 8, page 5B, line #52, dwelling #107, family #114. 1900 census, 6th Ward, New Iberia, Iberia Parish, Louisiana; roll T623-565, ED 35, page 17B, line #50, dwelling #333, family #333. The "Lafayette Advertiser", Jan 13 1904; http://www.ancestry.com. The "Lafayette Advertiser", Jan 20 1904; http://www.ancestry.com. The "Lafayette Advertiser", Oct 19 1904; http://www.ancestry.com. 1940 census, Ward 3, Calcasieu Parish, Louisiana; roll T627-1390, ED 10-19B, page 1A, line #13, household #4. New Orleans, Louisiana Death Records Index, 1804-1949; http://www.ancestry.com.